Although I retired as a Squadron Leader in the RAF, my wartime service was in the Royal Navy, in which I continued to serve until 1956. 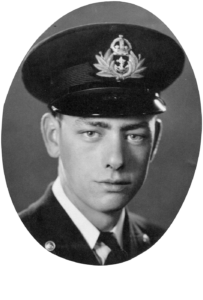 On D-Day, as a Midshipman RNVR, I was the 1st Lieutenant (second-in-command) of LCT 442, a vessel of the 15th LCT Flotilla in D Squadron of G Force. The captain was Sub Lieutenant E C Lane, RNVR. We sailed from Southampton at 1700 on 4 June, expecting to beach in France the next morning. However, the weather was bad and we were recalled as we were passing the Needles. We secured for the night alongside an American LST in the Solent, and sailed again on the evening of 5 June. The original plan was that we should carry nine British-built Valentine DD (swimming) tanks, but after a disastrous exercise in Studland Bay earlier in the year, in which several Valentines were lost, it was decided that we should carry American-built Sherman DD tanks. Owing to their greater size, we could only accommodate five. Also, because they were heavier than the Valentines and needed a greater depth of water in which to float off, we had to have extensions fitted to the ramp in the form of shallow U-shaped angle-iron channels into which the tanks’ tracks fitted. When the ramp was in the raised position, they stuck up like two huge horns. When the ramp was horizontal, approaching the beach, they had the potential to trap and detonate any obstacles that got in the way. Our tanks belonged to the Sherwood Rangers (troop commander Captain W Eldridge), part of the 50th Northumbrian Division, and we were supposed to launch them three miles off Jig Green beach at H-Hour minus thirty minutes. On our arrival at the launch position the sea conditions were unsuitable to launch so, in accordance with sealed orders, which we were not allowed to open until we were well out to sea, we beached over the obstacles at H-Hour at Asnelles-sur-Mer. My job was to supervise the lowering of the ramp, then to stand on the end of it, very mindful of the ‘horns’, and measure the depth of the water with a sounding pole. It was sufficiently shallow here to allow the first three tanks to swim a few yards before touching down on the sand. Then a mortar bomb exploded about thirty feet behind me on the tank deck. I was unhurt, but one of my sailors was wounded, and the flotation screens of the two remaining tanks were ripped. The captain therefore had to drive the landing craft in closer so that these tanks could leave dry-shod. As they did so, another mortar bomb exploded alongside the last tank. Captain Eldridge was riding on the turret directing operations, and must have been mortally wounded. He still managed to get his troop ashore, but we lost sight of them as they made their way up the beach. By then we were busy with our own problems. Our landing craft was badly damaged by the first mortar bomb and by Teller mines, which had blown a 10-foot hole in the port side, opened up the plating of the port bow and twisted the port rudder hard-a-starboard. Also, another LCT had broached to across our stern and severed the stern anchor wire. Having driven the ship so far up the beach, the captain was having great difficulty getting her off without the stern anchor to heave on. I was busy raising the ramp, and, with the aid of the coxswain, Leading Seaman Armstrong, taking care of our casualty. Eventually, our landing craft slid back into deeper water and floated off. As she moved astern, a stick of three mortar bombs exploded in the water immediately ahead of us – just about where I had been standing a few moments before. We made our way to a hospital ship lying off shore and transferred Able Seaman Laurence into their care. We then proceeded to a pre-arranged collecting area for damaged vessels and joined an ‘old crocks’ convoy for a night passage home. We berthed in Southampton and were granted a few days leave. The captain and his watch went first, and I and my watch (two seamen, the signalman and the motor mechanic) were left to tidy the ship up. Two days later, I received orders to take our landing craft to Shoreham for repairs. I reminded our superiors that the captain was on leave and that I only had half a crew, but was told that it was imperative to get her there in time to fit into the repair yard’s programme. With me in temporary command, we sailed the following day for the short, but interesting trip, bearing in mind that we were listing heavily to port, that we were down by the head, and that one of the two rudders was still jammed at hard-a-starboard. Repairs at Shoreham took four weeks. While we were there, the Germans began to send their V1 (‘Doodle-bug’) rockets over, and we had the satisfaction of seeing an RAF Mustang carry out its wing-tipping manoeuvre on one of them, and then shoot it down into the sea. After our repairs were completed, we rejoined the flotilla, which was engaged in the cross-Channel ‘shuttle’ between Southampton and the beachheads. This continued until the Canadians captured Boulogne, when our operational base moved to Dover. The shorter crossing speeded up the shuttle considerably, but Boulogne was a dangerous place to begin with. On our first entry, a small tanker just ahead of us suddenly blew up. Unknown to us the Germans had sewn every type of mine – free-drifting, moored-contact, magnetic, acoustic, pressure, etc – inside the harbour. Luckily for us, Coastal forces and the mine clearance teams made short work of them, and we continued to ferry troops, vehicles and stores across the Dover straits until shortly before the German surrender. We then sailed for Milford Haven, where we paid the ship off, and I was sent to join a newly-built ship, HMLCT 1324 (84th LCT Flotilla) to work her up for the invasion of Japan. Fortunately, this did not happen.